Clean the home – Give your home a good spring cleaning to make sure it’s dust and dirt free. Remove the clutter and organize your closets, cabinets and bookshelves in order to leave a strong impression. Use bright colors – Introduce bright and cheery colors into your home decor, such as tablecloths and throw pillows that give off a spring vibe. Colors such as yellow, pale blue, light green and lavender are particularly effective. Let the sun come in – Make sure all the window blinds are raised and the curtains pulled open to let in as much natural light as possible. Introduce spring scents – Create a cozy atmosphere by introducing certain aromas. You can do this by adding fresh flowers to your decor or even baking cookies before buyers arrive to view your home. Prepare the entrance – Add a welcome mat and an umbrella stand in case it rains. Buyers will appreciate the thought and will be ready to view your home in a better mood because of it. 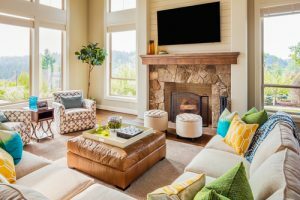 Use these tips to stage your home this spring to improve your chances of selling your home quickly. For professional home selling advice, contact us at Randy Lindsay to speak to a real estate agent in Fort Mill, SC today.